Sachin Tendulkar has finally breaken long jinx without a century on Thursday to reach his 40th test ton as india set up India's 311-5 on the first day of the fourth and final test against Australia. Tendulkar had not reached three figures since the final match against Australia in Adelaide in January,before bringing up his 40th test century — and 10th against the Australians — with 109 from 188 deliveries. Tendulkar said - After Adelaide test match, I have played around six or seven matches .I knew I was batting well, but I was not getting to the three-figure landmark. But I never think that is everything.Each test century is a different one and has its own importance for me. Today i played little different than my usual style. 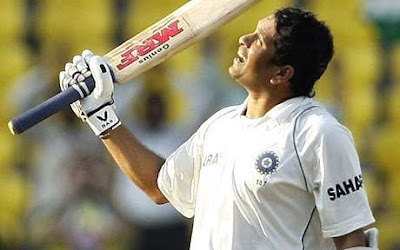 Tendulkar who struggled in the series against Sri Lanka earlier this year but has been one of India's key batsmen against Australia, scoring 384 runs.As you have seen in this test series, I have played at crucial moments almost four or five times and I have been able to play,Little master said. That is very satisfying when you deliver when the team needs you the most, and that is what I have been able to do in this series.Tendulkar came out to bat with India 99-2, and the situation worsened when Virender Sehwag departed 17 runs later for 66.The world's leading run-scorer didn't look troubled until he neared his century and was dropped twice — on 85 and 96 — at mid-off by Mitchell Johnson and Brett Lee from the bowling of rookie offspinner Jason Krejza.I can say that he was a bit unlucky," Tendulkar said of Krejza,who is now four hundreds ahead of Australia captain Ricky Ponting in second place, said he isn't bother about the records.I am not playing for these targets. I am just playing for the team and while contributing towards the team's cause, if it happens it is a great satisfaction.But it is important to bat well when you get that chance and build up a big score. The momentum that builds up during the game happens when you bat first."